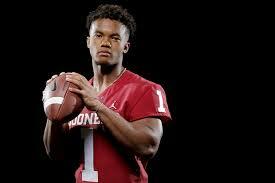 NORMAN, Okla. (AP) – Oklahoma quarterback Kyler Murray was a first-round Major League Baseball draft pick this summer who easily could have dropped football altogether. Instead, he successfully replaced Heisman Trophy winner Baker Mayfield and then some. He posted one of the best statistical seasons in college football history to become a Heisman finalist himself. He joins the likes of Bo Jackson and Charlie Ward as players who are highly accomplished in multiple sports.